Peter is a Wellington born Musician who has been playing piano since the age of seven. Developed valuable playing experience in pop and Jazz as a performing Musician since 1982. After Years of experience in the popular music scene of Wellington, and New Zealand Peter moved to Melbourne Australia to experience the Australian music business. Worked as a professional Musician in Melbourne Australia from 1987 – 1994. I enjoyed performing regularly around the venues of Melbourne and Victoria. Teaming up with the Australian Musicians, I managed to be involved in a great deal of composing and recording. A very fulfilling stage of my career was being able to perform original compositions in the venues of Melbourne and hearing my own songs on the radio. It was in Melbourne Australia that I started teaching regularly and learnt how much I enjoyed teaching. So much so that I joined the Victorian Institute of Registered Music Teachers. Upon returning to NZ I Tutored at Whitireia Community Polytechnic for five years Taking composition, Band combo classes, professional studies, and keyboard classes. In 1998, after successfully completing piano performance and theory exams, I was admitted as Licentiate to Trinity College of London, LTCL. During these career stages and on, I had the pleasure of experiencing many performance situations. Solo piano work, small combo work, from 3 piece to 7 piece with brass section and big band work. In both New Zealand and Melbourne Australia. Composition, recording and the performing of original works has been a passion for myself and a major part of my career. 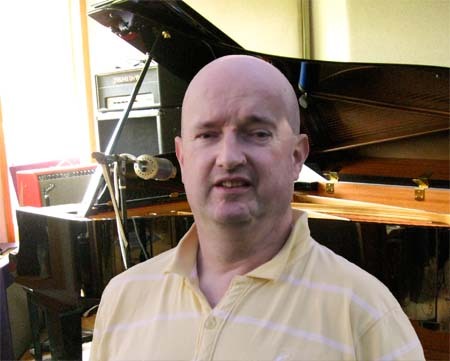 Having taught music privately since 1987 I became registered with the IRMT NZ in Piano and Jazz piano in July 2000. I have developed my private teaching in both Hataitai and Karori. Offering tuition in Jazz, Pop and Classical Piano including theory and composition. I am currently part of The Friday Club. A playing group of fine pianists who perform in the Wellington area. See dates for the next performance.